This is my latest build. 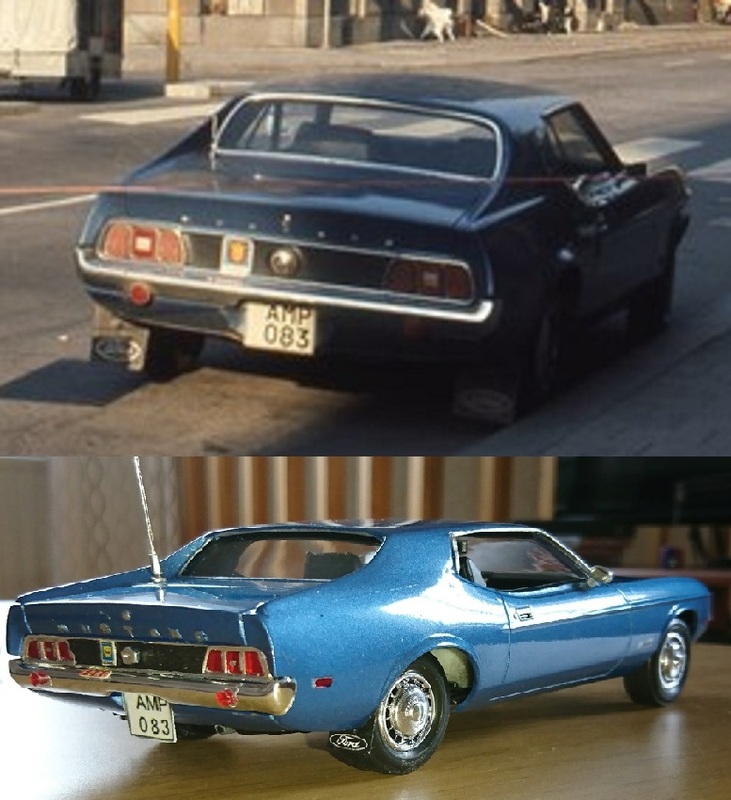 The real car was sold by the bolivian or brazilian ambassador in sweden, to a swedish police officer, in 1972 or -73. Then, in late August 1973 a bank robbery took place in Stockholm/Sweden. The robber, Jan Olsson, made demands for a fast getaway car and also wanted the police to release another well-known bank-robber, Clark Olofsson, out of jail along with a big ransome for the hostage he kept in the bank vault. 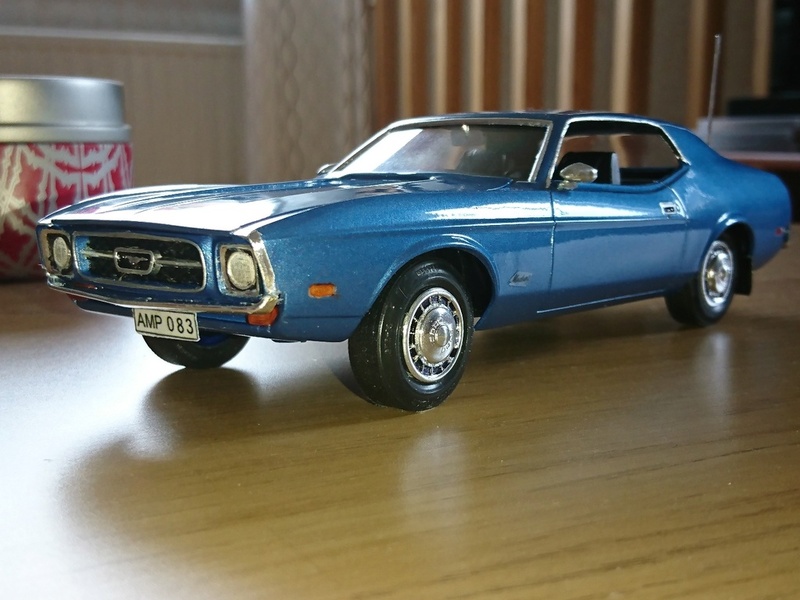 The swedish police officer offered his personal car, The Mustang, to be used as getaway-car. 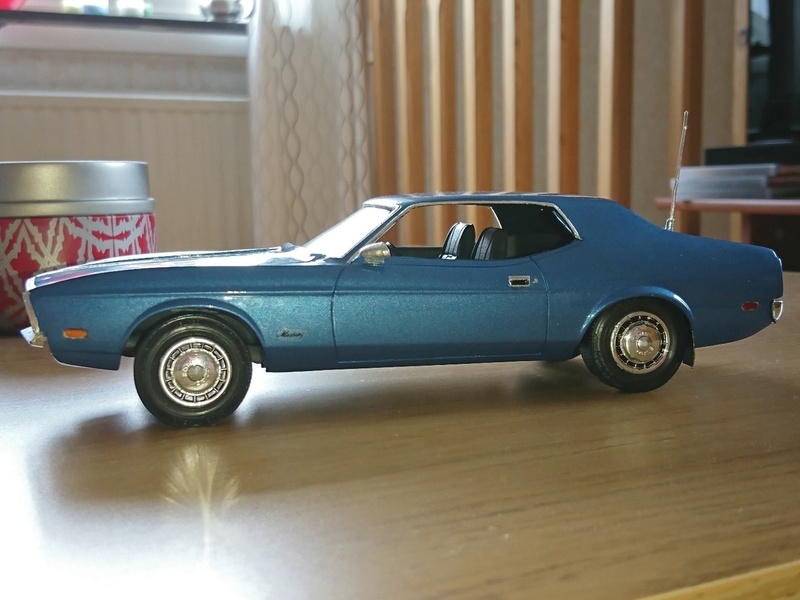 I built this Mustang using the last re-issue of the old 1972 Mustang Fastback and a re-issued 1972 Mercury Cougar for the roof. The hubcaps were built by combining custom wheels from a 1958 AMT Chevy Impala and the hubcaps from a 1950 Ford. great job, great car !! I love the story, ! Yes, just like Marc-Antoine. You did a great job to melt the Mustang & Cougar parts. Do you know how did the car end (destroyed, or still existing) ? Very cool job and interesting story! Yeah, just like Ford Fan, I am wondering how the story ended ? I hope the car hasn't been destroyed! and what a funny story ! The real car still exists, in a garage about 840 kilometers north from where I live. I got help from both the original owner and the present owner when I built the kit. The car right now is in a miserable state after spending many years as a dragrece-car! The bankrobber later "straightened up" and became a car salesman!!!! He's still alive as well, as is the other "robber" that got released from prison during the robbery, Clark Olofsson. That man is however still in prison, in Belgium or the Netherlands I believe, and has never "straightened up" from being a criminal. Nice story and great car. Not usual to see this model here.